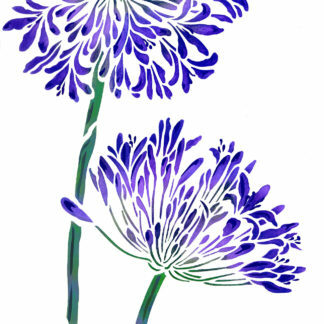 View cart “Large Agapanthus Stencil” has been added to your cart. The Oversize Wild Rose Stencil is inspired by the classic delicate English rose, found in the hedgerows of country lanes – created here on a larger than life scale for impressive, contemporary decorating. This stencil design is perfect for exquisitely large wall art and to create elegant oversized hand printed wall paper effects and for decorative panels. Ideal in hallways, living spaces, alcoves, stairways; or print fabrics to create room dividing panels, full length curtains or simply as hanging art. Large two sheet stencil with registration dots for easy alignment of the two sections, which can be used together or as seperate motifs. See size and layout specifications below. 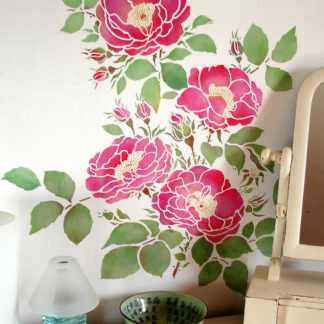 Above – Oversize Wild Rose stencilled in Raspberry, Cerise, Eucalyptus, Olive Grove and Chocolat Stencil Paints. This design lends itself to a host of colour combinations to suit different decorating styles. Use soft blush pinks or apricots and leaf greens to emulate the briar roses of country lanes and gardens for that modern shabby chic style. Or use more graphic charcoals and greys for a sharp modern look, or pallettes of soft monochromatic colours such as green, blue or greys for open modern spaces. Try hot pinks and reds for bold but beautiful statements. Or use subtle metallics or pearlescent paints for effects that glimmer in different lights; or use gilding techniques with metal transfer for sumptuous, impressive gilded finishes. Stencil this oversize design with our Stencil Paint range and our Stencil Rollers and Stencil Sponges. Or use coloured spray paints – to cover large areas with subtle veils of colour. 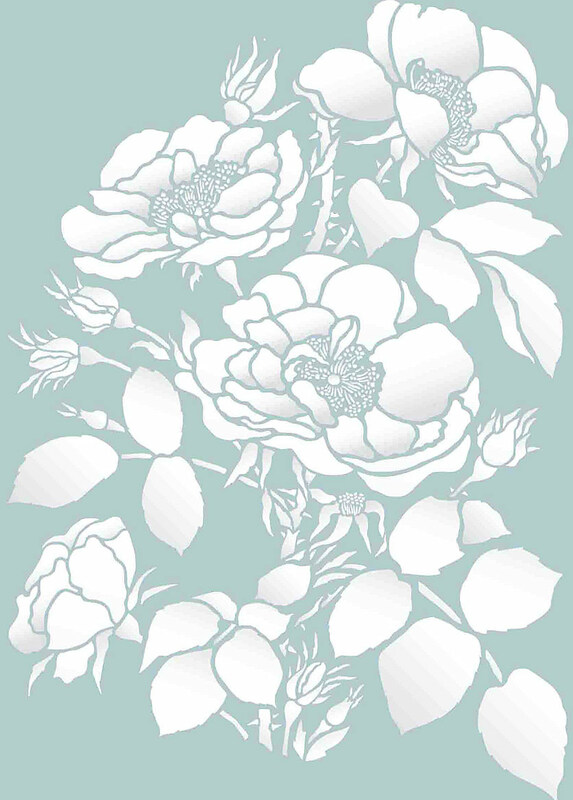 See also the soft blousy, full blown Cottage Rose Stencil, which naturally complements this design. Other large flower designs include the Giant Hogweed Stencil, Large Agapanthus and Cherry Blossom. Above – close up of section 1 of the Oversize Wild Rose Stencil. 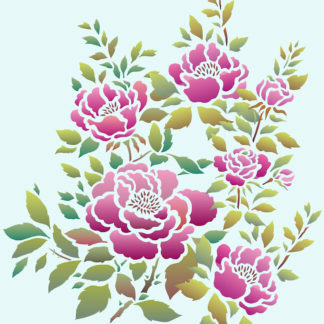 Shown in Orchid, Peony, Plum Blossom Stencil Paints (flowers), Chocolat Stencil Paint (stamens), Eucalyptus, Hedgerow and Sienna Stencil Paints (leaves and stalks). Above – close up section 2 of the Oversize Wild Rose Stencil. Shown here in Ice White and Shoreline Stencil Paints on a pale duck egg background. 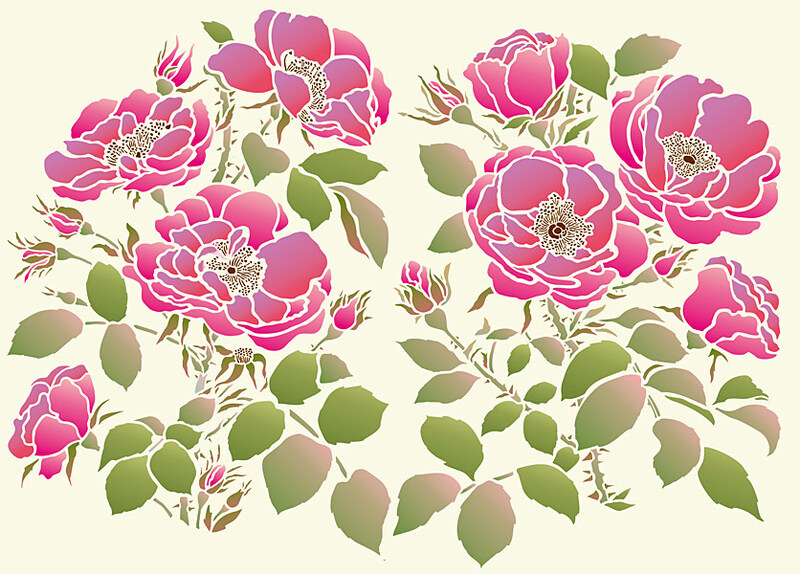 Above – sections 1 and 2 of the Oversize Wild Rose Stencil. 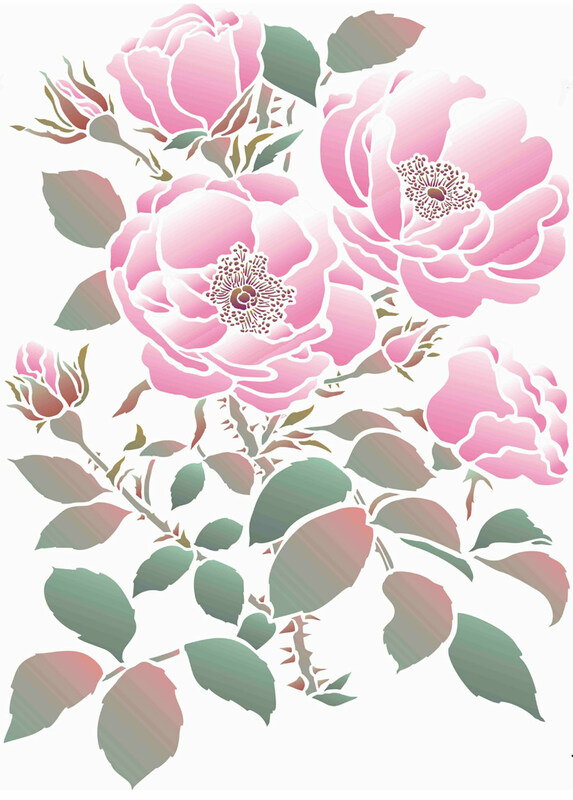 Stencil together or as individual rose motifs. Stencil Paints shown here Alba Rose, Azalea, Cerise (flowers), Coffee Bean (stamens), Hedgerow, Verbena and Sienna (leaves and stalks). 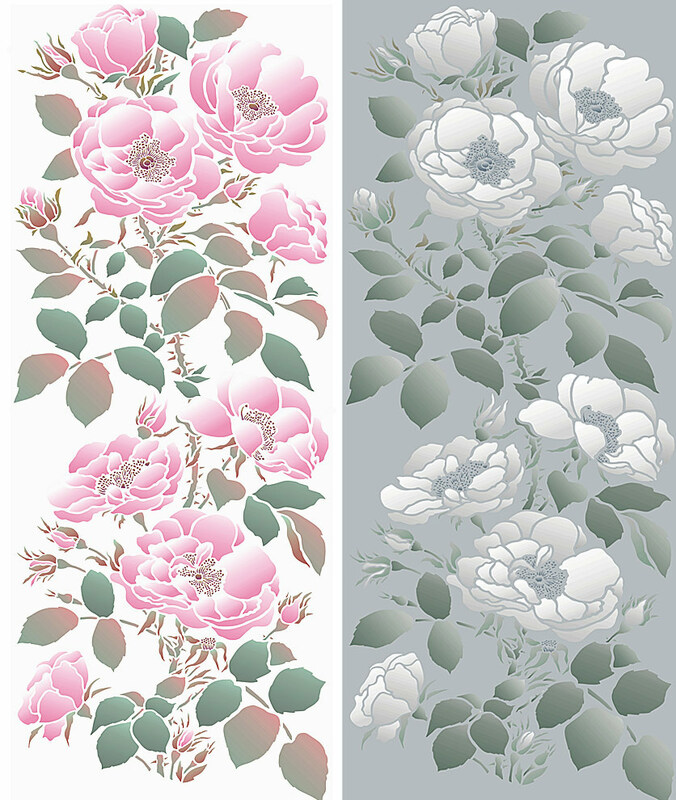 Above – create the effect of extra large hand printed wallpaper using the Oversize Wild Rose Stencil repeated in columns, with the top and bottom sections being alternated to give this dynamic rose effect. 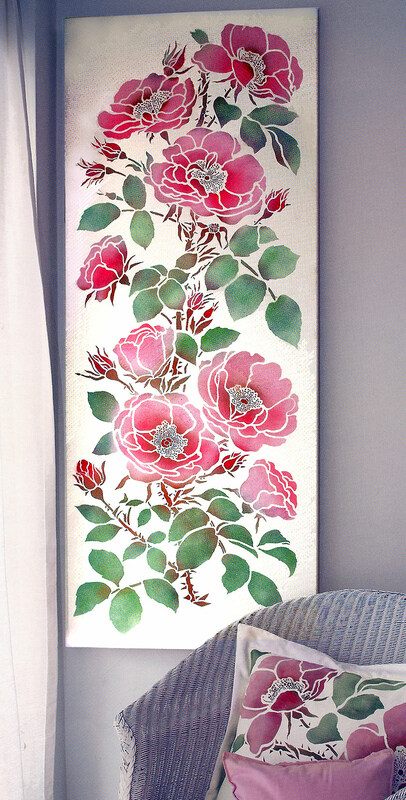 Above – the Oversize Wild Rose is stencilled onto cotton calico and then stretched onto a wooden frame/artist’s stretcher. 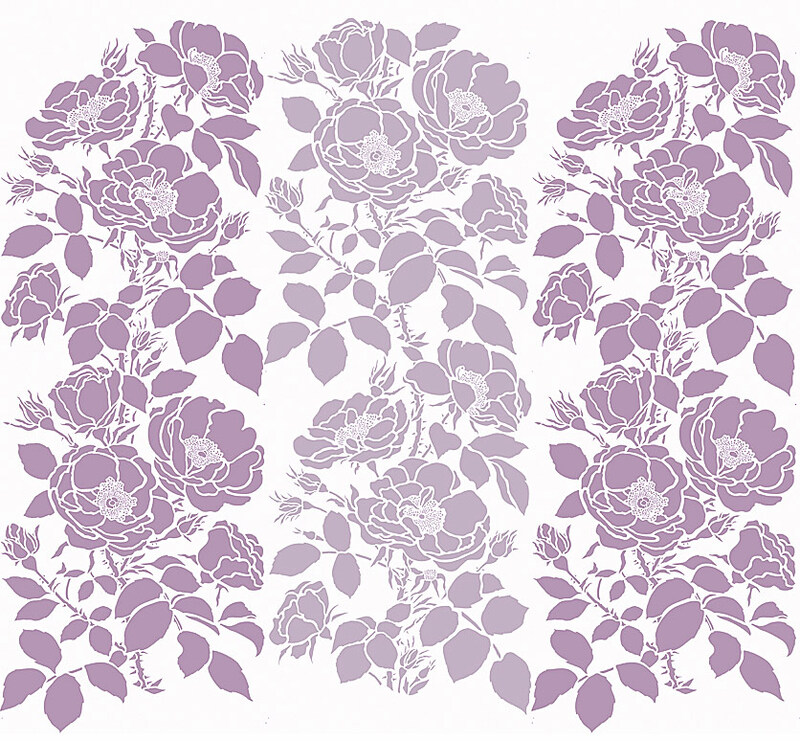 Stencilled in Very Berry, Azalea, Orchid, Eucalyptus, Woodland and Chocolat Stencil Paints. Above – close up detail of the Oversize Wild Stencil stretched onto an artist’s canvas after stencilling. Colours as above. 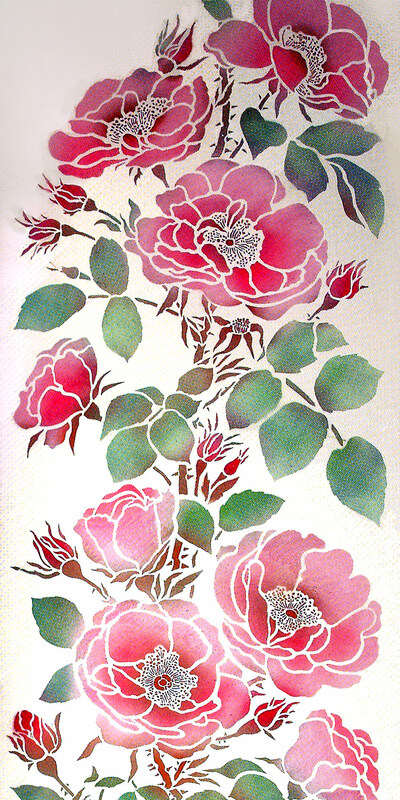 Above left – Oversize Wild Rose, with top and bottom sections reversed, stencilled in Orchid, English Rose, Eucalyptus, Emerald Forest and Coffee Bean Stencil Paints. Right – in Ice White, Eucalyptus, Willow and Arctic Grey Stencil Paints on a grey background. Above left – in Raspberry, Cerise, Woodland, Olive Grove and Verbena Stencil Paints. Right – in Orchid, Damask Rose, Mocha, Cinnamon, Harvest Gold and Ash Green Stencil Paints. 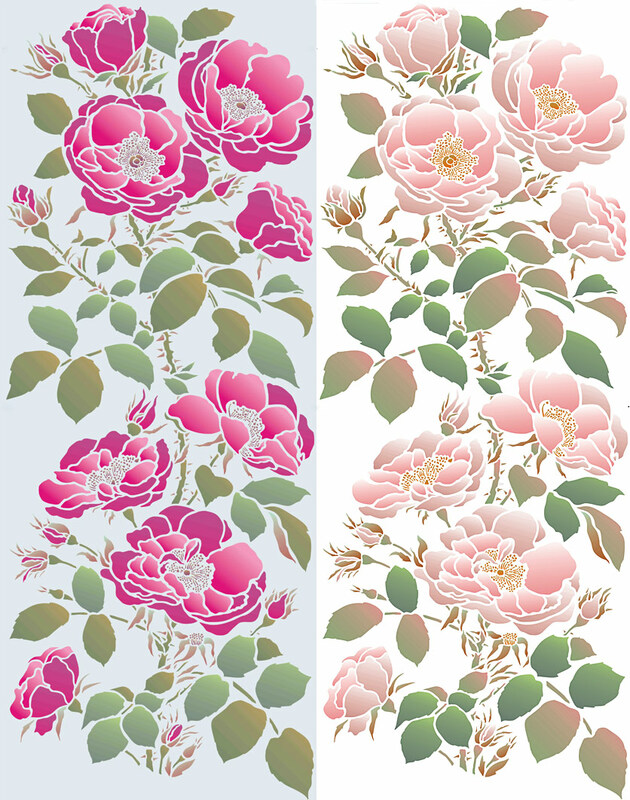 Wild Rose Stencil – One layer stencil in 2 large sections that both repeat vertically to any desired height/length. With registration dots. Both top and bottom sections are interchangeable, so you can alter which motif is on top and continue repeating vertically as required. The motif of section 1 measures approximately 75cm (29 1/2″) high by 55cm (21 1/2″) wide. (Section 1 is illustrated below right). The motif of section 2 measures approximately 74cm (29″) high by 55cm (21 1/2″) wide at furthest points. (Section 2 is illustrated below right). Section 1 and 2 stencilled vertically together measure up to 1m 40cm (4ft 7 inches). The rose heads are all on the same scale up to approximately 29cm (11 1/2″) wide. Sheet size 90cm (35 1/2″) tall x 67cm (26 1/2″) wide. Left – section 1 & 2 of the stencil.